The upcoming 100th anniversary of the Medz Yeghern, or the “Great Catastrophe,” is highlighting the mixed feelings that Turkey’s tiny ethnic Armenian minority has for President Recep Tayyip Erdoğan’s administration. On April 24, Armenians around the world will mark the World-War-I-era deaths of hundreds of thousands ethnic Armenians in Ottoman-era Turkey. It is a tragedy that for many historians and analysts constitutes an act of genocide. Ankara’s official position is that the number of reported deaths is exaggerated and that the victims died during a wartime attempt to put down a domestic uprising. Until recently, the governing Justice and Development Party (AKP) seemed increasingly open to public acknowledgement of the massacre. For example, for the past five years at Taksim Square, in the heart of Istanbul, hundreds of ethnic Armenians and Turks held an annual vigil on April 24 to commemorate the slayings. “The state’s perception of 1915, of Armenians, has changed in a positive way from before,” claimed Markar Esaian, a prominent Turkish-Armenian columnist for the pro-government Yeni Safak newspaper. Last year, in a first for a senior Turkish official, then-Prime Minister Recep Tayyip Erdoğan offered condolences to the relatives of those who had died during the mass killings of 1915. The statement was widely described as groundbreaking. But as international preparations began for marking the centennial of the killings, there has been a marked shift in the Turkish leadership’s rhetoric. Armenia and Turkey are locked in a verbal tussle not only over claims of genocide, but over allegations that they are both trying to upstage each other on April 24. On that day, Ankara plans to mark the World War I triumph of Turkish troops over allied forces at Gallipoli. The commemoration of that victory in previous years had been held in March. During his presidential campaign last August, Erdoğan termed being called an Armenian “even worse” than the usual political insults. Nationalist rhetoric often marks Turkish political campaigns, but some fear that, in addition to the tension surrounding April 24, anti-Armenian slurs could incite nationalist attacks. In March, an Armenian church in Istanbul was covered in anti-Armenian graffiti. The experience of the Jewish minority also provides cause for concern. In March, a pro-AKP television station broadcast a 90-minute documentary about alleged international Jewish conspiracies against Turkey. Political scientist Ayhan Aktar of Istanbul’s Bilgi University sees the AKP’s nationalist remarks as rooted in Erdoğan’s desire “to be the defining leader of Turkey of the 21st century.” There is also a pragmatic reason for Erdoğan’s shift: for the past two years, he has been engaged in a political struggle with former ally Fethullah Gülen, an influential Islamic cleric who lives in self-imposed exile in the United States. Some local observers believe that to win such a battle, the president is trying to woo a new ally – the military. Erdoğan has had a tense relationship with the military, spending much of his tenure as prime minister trying to diminish the political influence of Turkey’s generals. But in March, Erdoğan apologized to generals arrested as part of a wide-ranging coup investigation for wrongful prosecution. In April, the courts overturned all 236 related convictions and released all those jailed. Some of these individuals are popularly believed to have been part of the so-called derin devlet, or deep state, a shadowy group of officials and military brass that ran extra-legal operations. The deep state is widely blamed for being behind assassinations and attacks against Turkey’s ethnic Armenians. 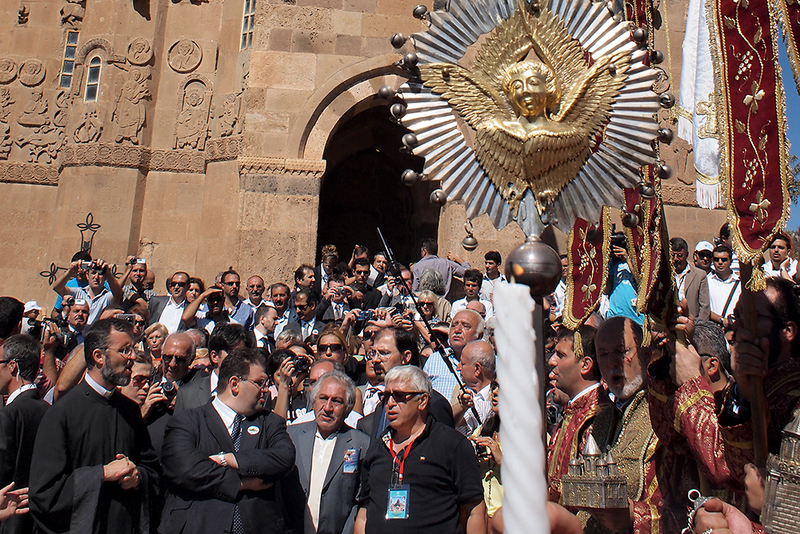 Consequently, the releases pose a dilemma for ethnic Armenians about how to view the AKP. Hope persists that with the conclusion of the two centennials and the June elections, tensions will subside. But some prefer to stay cautious. “I want to believe the steps [toward better relations with ethnic Armenians] are permanent, but I am not sure,” said Agos’ Danzikian. Dorian Jones is a freelance reporter based in Istanbul.